This sidewall was created by de Botton for Rasch c. 1950, and left as a bequest to Cooper Hewitt by the artist. 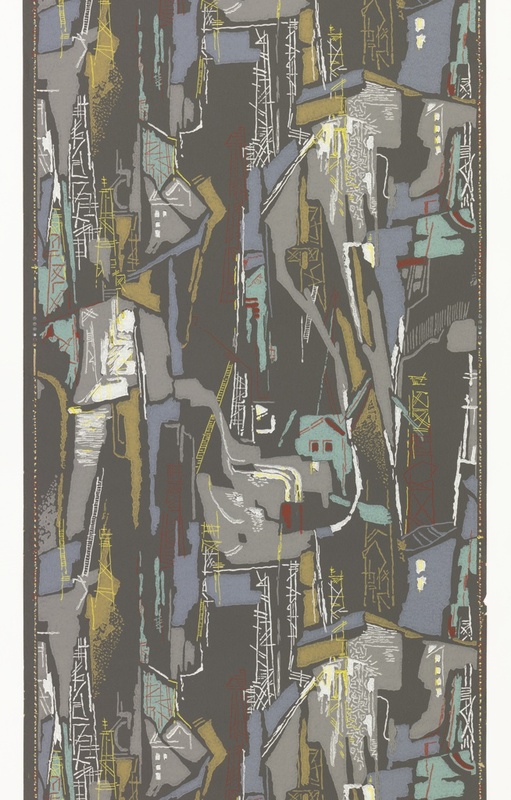 Titled “Mexico,” the design doesn’t reflect the familiar trope of Aztec-inspired zigzags, but instead captures the rhythm of the tangled, vertical landscapes and urban sprawl of a twentieth-century Mexican metropolis. Scaffolding, roofs and housing facades are rendered in thin lines and broad brushstrokes, and stacked in chaotic, overlapping columns. Light blues and yellows stand out with muted reds against a gray backdrop, capturing the mood of the brightly colored, dust-covered homes that creep up the mountains surrounding Mexico City. A fully-scanned version of Rasch’s “International Artists Collection” catalogue is available here via Smithsonian Libraries.